Usenet Farm has a commendable focus on tight privacy, plus it’s affordable with generous data allowances – although retention is a weak point. If there’s one obvious pattern in the newsgroup industry, it’s that many of the leading providers are based in the Netherlands – and Usenet Farm is no different. The service is aimed at people who want a powerful yet affordable offering that puts privacy at the forefront. Unlike other Usenet providers, you don’t need to enter all your personal details to use the platform. There aren’t any registration forms or passwords, meaning you don’t have to worry about your information being sold on to third parties, or spending time logging in. Instead, you just enter an email address and you’re sent a special login link. There’s also an emphasis on anonymity. The company will only store your name and country, rather than all your personal details. And you have the option to pay for your account through Bitcoin, so no one will be able to track your payment details or transactions. As you can see, privacy is definitely at a premium here. The company has also made a commitment to be transparent and listen to customers. It doesn’t offer services you don’t need, and when choosing a plan, you know exactly what you’re getting – there aren’t any hidden extras that may end up costing you more. Retention is always important when it comes to performance – it refers to the amount of time articles are stored. Rates differ from provider to provider, although many offer over 1,000 days, and some over 3,000 days. Usenet Farm boasts a binary retention of 900 to 1,100 days. That’ll be fine for most users, and of course, these numbers can change over time. Another key point about this company is that it’s capable of checking other Usenet services, if an article can’t be found on its own platform. Usenet Farm can also tap into Abavia (XS News) and Highwinds for articles. You get multiple platforms for the price of one, essentially. For any piece of software, the user experience is crucial. Fortunately, Usenet Farm does fine on this front, with a smooth interface and dedicated dashboard for members that allows for the viewing of statistics about your usage. This can be accessed via the main website, so you don’t need any additional components or software to get it working. If you have a slow broadband connection, you can run into problems. 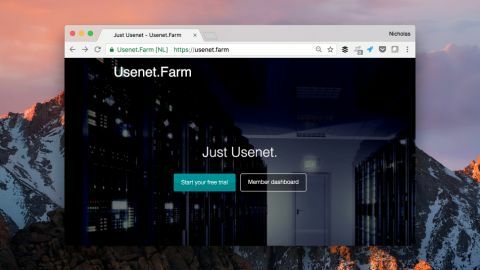 While Usenet Farm aims to max out your connection speed as best as possible on anything but the most basic plan, if you run into performance issues, there are troubleshooting tips on the website’s FAQ page. The firm also supports NTD/DMCA take-down, so you can report illegal content and it’ll be removed. There’s a specific form to facilitate this. In terms of other aspects of customer support, you can contact a member of the team via the website, and Usenet Farm aims to respond to tickets within 24 hours. Usenet Farm is not only affordable, but it doesn’t overwhelm you with subscription options. The cheapest plan (cheekily named ‘stingy’) costs €4.95 (£4.20, $5.40) monthly, and you get 24Mbps of speed, 2TB of data and 40 connections. For the €7.95 (£6.75, $8.70) ‘To the max’ monthly plan, you’re given unlimited speed, 3TB of data and 40 connections. Lastly, you can get a block plan for a one-off payment of €15 (£12.70, $16.40). With this, you get unlimited speed, 500GB of data and 50 connections. It’s worth mentioning that with the first two monthly plans, the data limit is simply a ‘fair-use’ allowance. In other words, you can download more than this, but after the data allowance has been exceeded, your download speed will be capped to 8Mbps for the remainder of the month. It will revert to the normal speed limit when the next monthly period arrives. Usenet Farm is an interesting offering. It may not be as accommodating as other platforms when it comes to retention rates, but the firm makes up for this with a generous data allowance. As well as this, it’s good to see that this provider is keen to please on the privacy front.